#stampinup #creationstation #saleabration2019 #faithfulinkspirations Welcome to our international blog hop. If you're hopping along, you'll have just come from Julie Beltramo's amazing project. Although our theme is all about springtime, the weather here in Maryland has reverted to January. We had snow on Friday and we're going to have more today! I'm not complaining--I love snow--but I've been hibernating more this winter than in the past and my stamping has suffered from it. But, never fear! 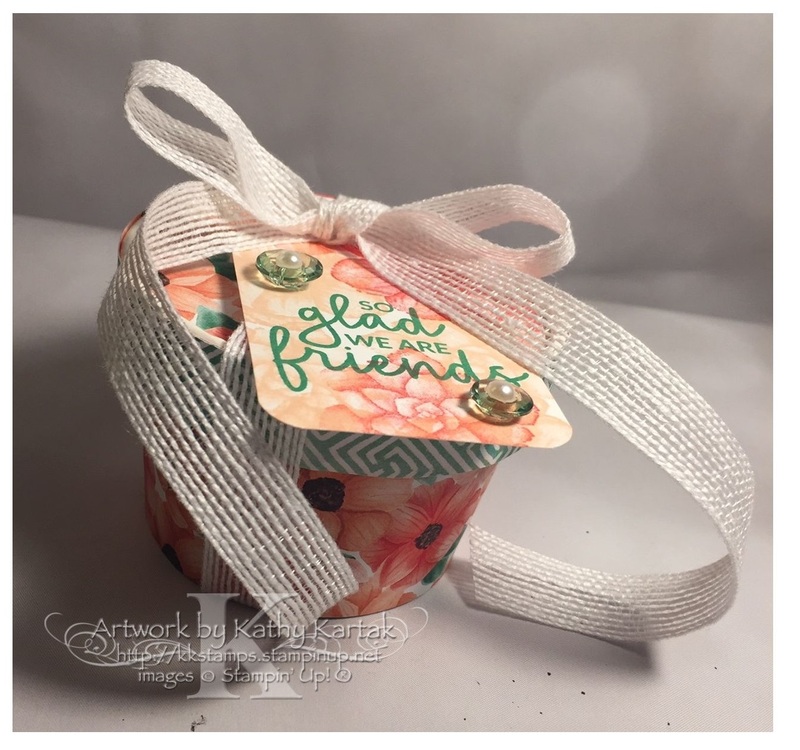 I have two quick and easy projects to share with you. First, though, I want to show you something. When I arrived in my stamping room I hoped for inspiration to hit. Sometimes it does and sometimes I have to work for it. I worked for it today. And here's the "craftermath"!! That doesn't show the floor and the cutting station--those were a mess, too. But I cleaned up after I took this photo. I like to have all my stamping stuff in its rightful place so I can find it the next time. 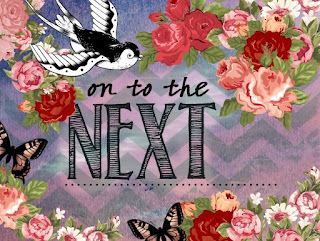 I just got a shipment from Stampin' Up and I had earned a Level 2 Sale-a-Bration item, so I chose the gorgeous Painted Seasons bundle. I also earned a Level 1 Sale-a-Bration item so I added the Country Floral Dynamic Embossing Folder. I had every intention of using these together in a coordinating project, but that didn't work out. So you get two uncoordinated projects--both are really simple to make. First up is a decorated Sweet Cup. I used the Painted Seasons Designer Series Paper to decorate the cup. That paper is super gorgeous--and a design for each season. Next, I made a tag to go with the Sweet Cup. 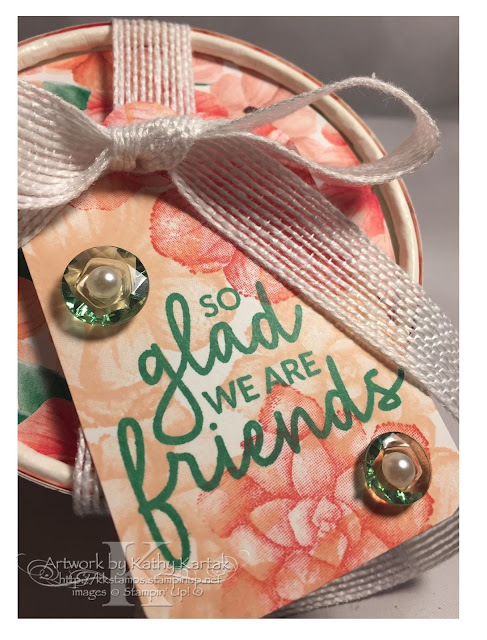 I stamped the flower and succulent from the "Painted Seasons" stamp set in Calypso Coral and Petal Pink onto a 2" strip of Whisper White that I turned into a tag. I used the Scalloped Tag Topper Punch and rounded the ends with the Envelop Punch Board. I stamped a sentiment in Call Me Clover from the "Incredible Like You" stamp set. I tied the tag onto the Sweet Cup with a long length of Whisper White Flax Ribbon. I adhered two Call Me Clover Tinted Faceted Buttons to the tag, using Glue Dots. Then I added a Pearl Basic Jewel to the center of each button. 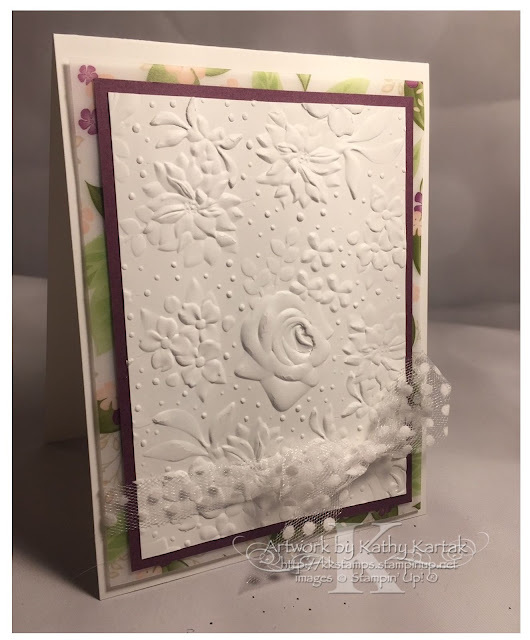 Since I wasn't able to use the Country Floral Dynamic Embossing Folder (and believe me, I tried! ), I decided to make another project. I originally thought to do a white on white card, but I decided to add a little bit of color. This card grew organically--which means it took on its own design and didn't turn out at all like what I thought I was making when I started!! I started with a Thick Whisper White Card Stock card base, cut lengthwise. 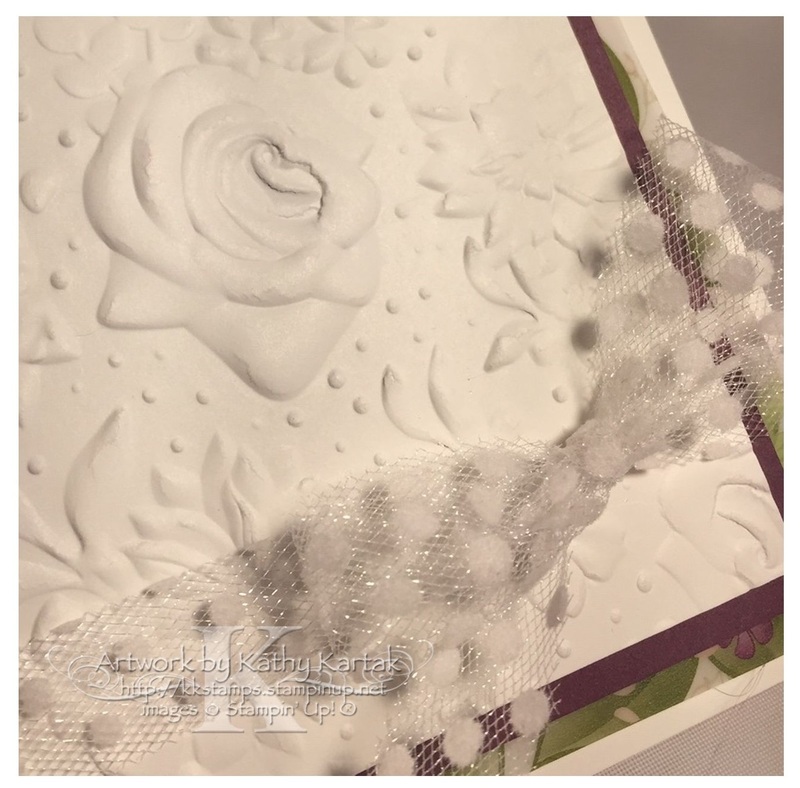 Then I embossed a 3-3/8" by 4-5/8" Whisper White Panel with the Country Floral Dynamic Embossing Folder. I adhered this to a 3-3/4" by 4-3/4" Fresh Fig Card Stock mat. I adhered that to a 4" by 5-1/4" Floral Romance Specialty Designer Series Paper printed vellum sheet. 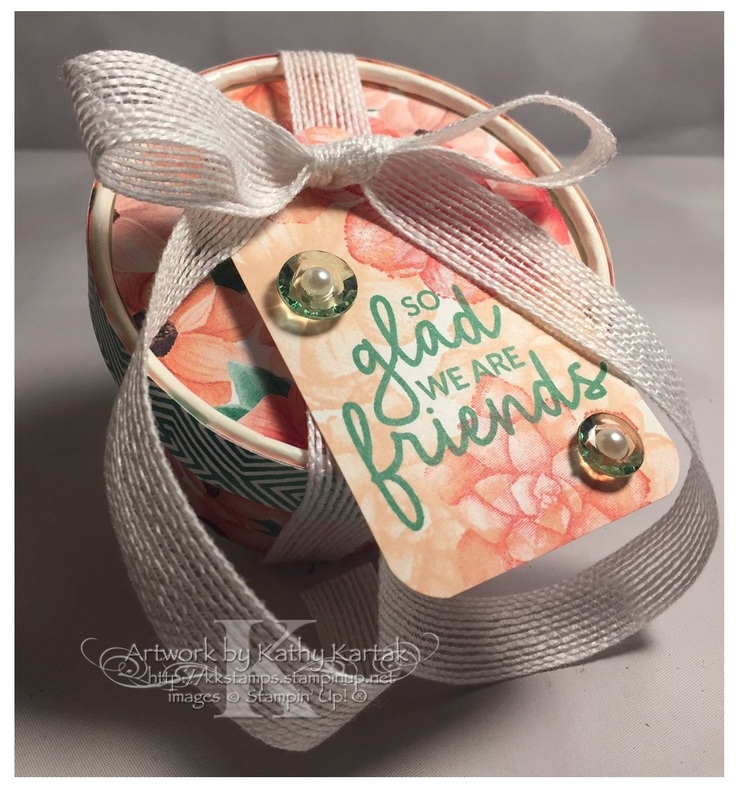 I wrapped a length of Whisper White Polka Dot Tulle Ribbon around, tying it in a pretty bow, and then adhered everything to the card base with Stampin' Dimensionals. 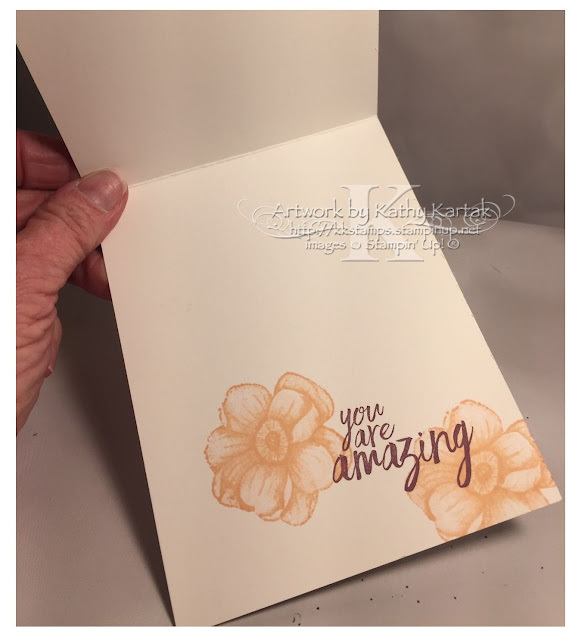 On the inside, I stamped a sentiment from the "All Things Thanks" stamp set in Fresh Fig Ink and added two flowers from the "Painted Seasons" set in Petal Pink. 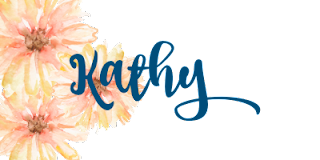 I hope you enjoyed my projects and the beautiful blossoms that can be found in all kinds of Stampin' Up products--stamps, designer series paper, and even embossing folders! Your next stop is the very talented Kerstin Kreuzer from Germany!